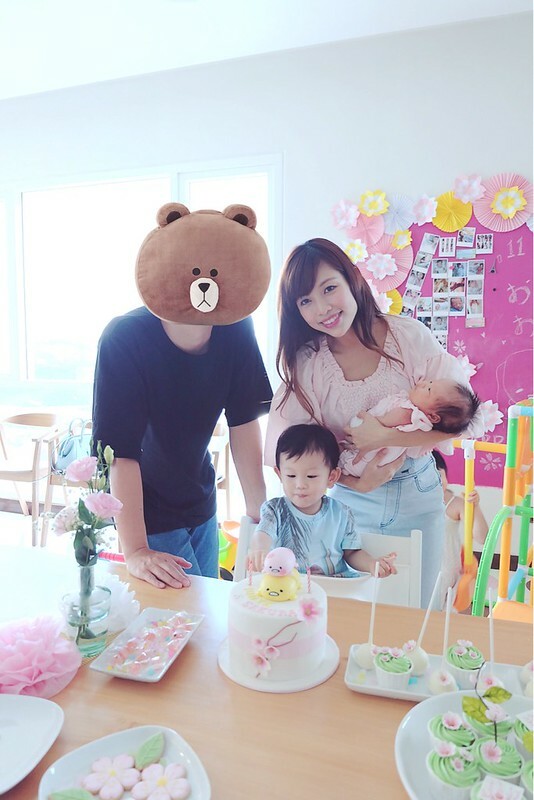 Finally he turns two, and this time around he has to share the party with his newborn sister, who was turning one month old on 11 June lolol. FHL really. Next year we will probably just throw a ALL-IN-ONE kind of party to save time and money and my sanity lol. Also, one party, 3 separate gifts!!!! 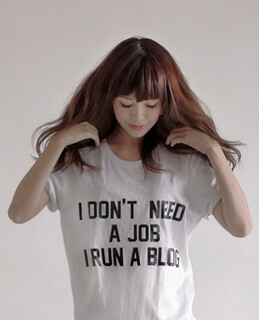 HAHA win. Am I smart or what lolol. 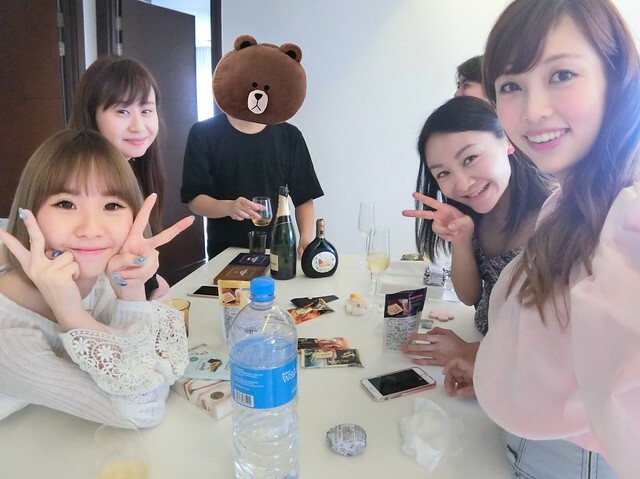 Ok now i think nobody will turn up at the party anymore XD. 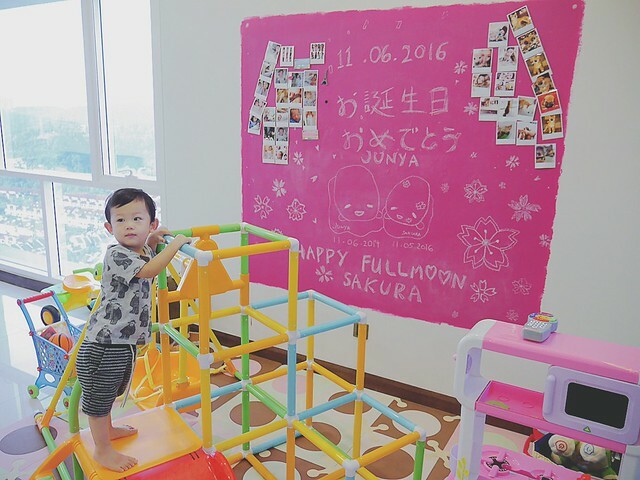 Junya’s second birthday and Sakura’s full moon 2-in-1 party! It looks quite nice right!!! Actually everything was planned only like a couple of days ago XD. 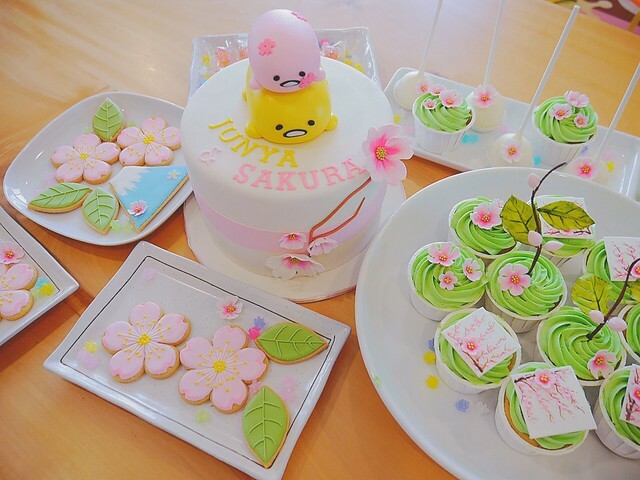 I wanted a simple party, maybe with a cake and some treats and just celebrate with the family. But everything ended up so much more wonderful than what I expected. 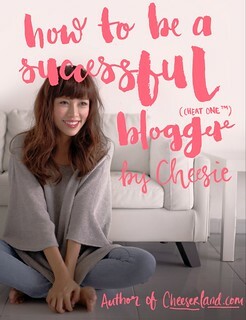 It wouldn’t even happen without the help of a few great people. 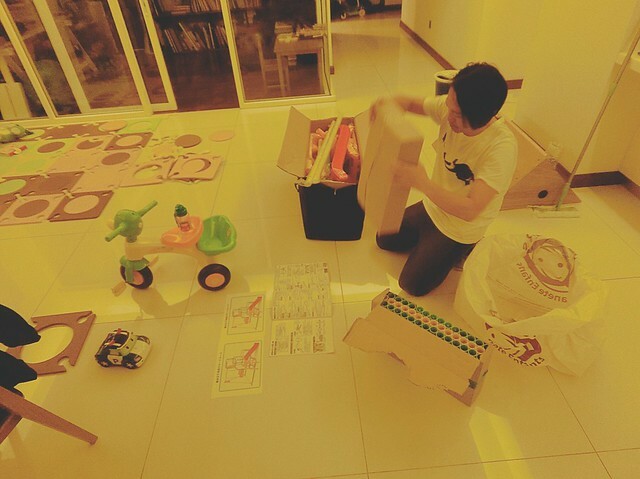 First of all there was papa who stayed up 3am cleaning the house and preparing his son’s birthday present, which he sacrificed his own luggage space to bring back from Japan. It is HUGE! And then there was Carolyn who drove all the way from Penang to help babysit Junya while I prepare the party. 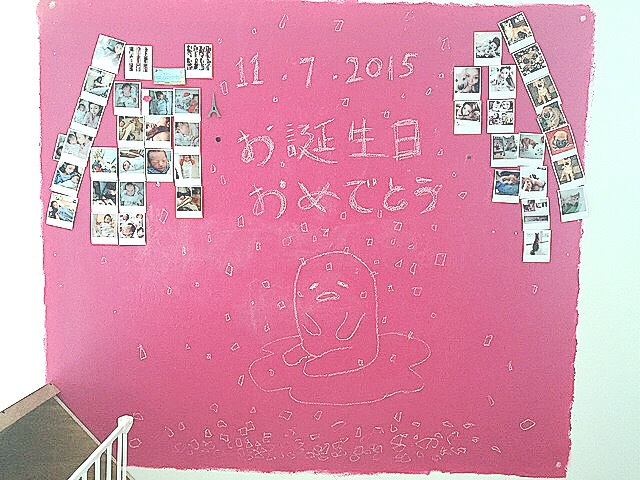 Who also helped me draw flowers on the deco wall. Speaking of which, the wall message is only changed once every year. Plus I usually just wipe off one or two number to write new ones. The next morning! Junya woke up to a his first present. Somehow having a girl makes me wanna wear pink and pastel every day again. Her clothes are all too pretty I think I am feeling competitive already XD. Our dessert table!!! Isn’t this SUPER amazing?? All the cake, cookies, cupcakes and cakepops are all done by I Have Sweet Tooth, which accepted my super last minute request and produced everything under a 2-day notice. Super love!! I didn’t know what kind of theme to do actually because Junya doesn’t have any particular preference or favorite characters yet. For Sakura it’s easy because it’s… quite literal lol. But I wanted something of brother and sister love kind of theme. 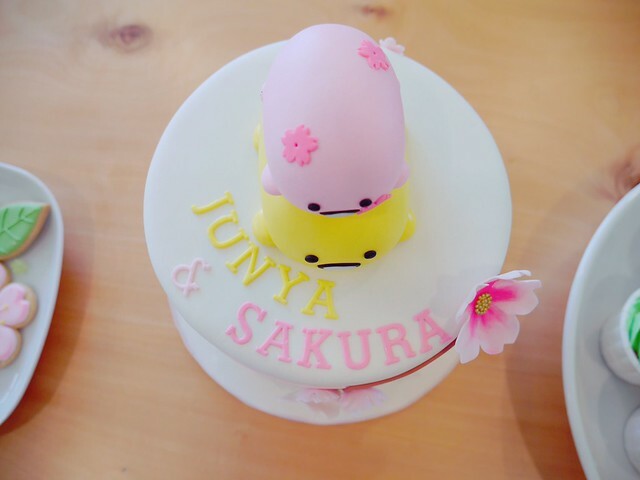 So I requested the theme to be cherry blossom, and the cake to be a Gudetama (Junya loves Gudetama) and a little Sakura mochi (pink Gudetama). 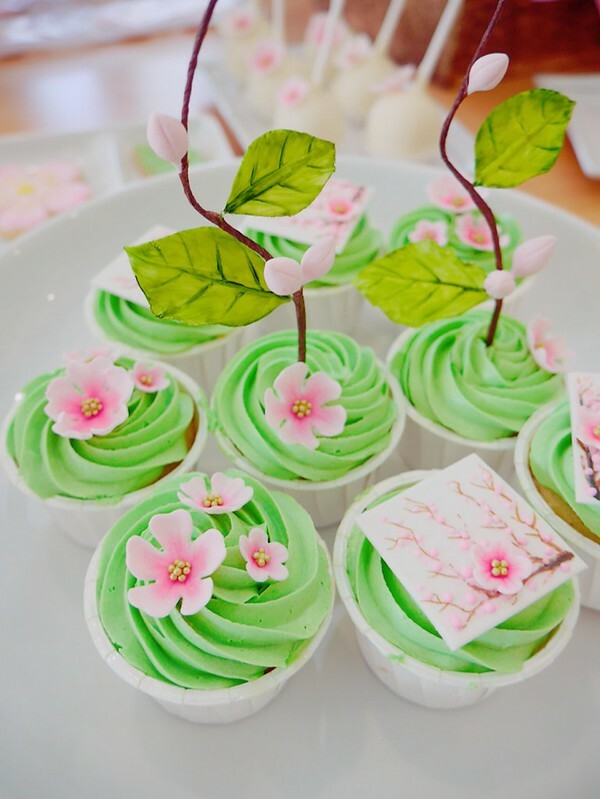 Cupcakes were also cherry blossom, with full bloom sakura and even little petals! The cookies are simply… perfect. I don’t know how anyone can come up with such great details. The cake artists Marina & S. Wei are insanely talented geniuses. 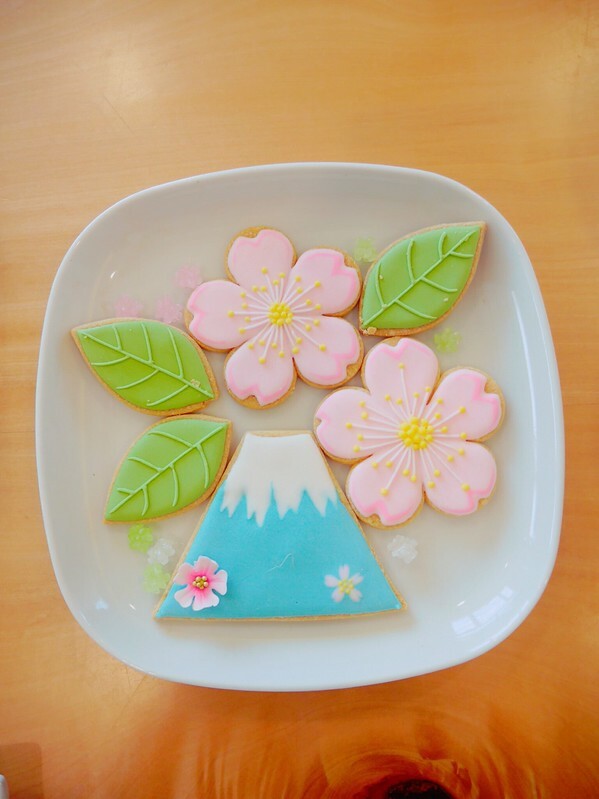 Even the Mt Fuji cookie has a little sakura painted on it. Nobody will have the heart to eat this!!! So if you are looking for novelty cakes and desserts to be made, please check out I Have A Sweet Tooth on FB, and @ihavesweettooth on Instagram. for their super amazing cake designs. I also owe to You & Co who did simple decorations for the party! 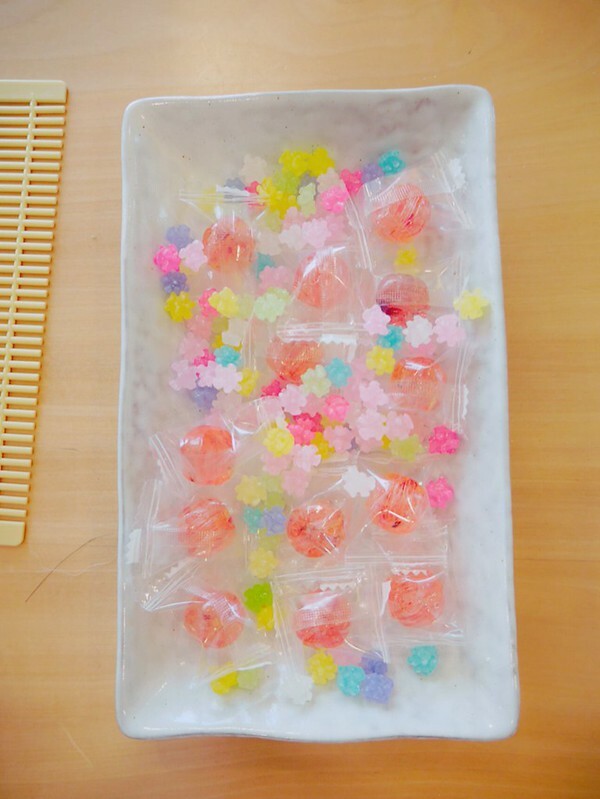 Some cherry blossom petals for the backdrop wall and table setting! 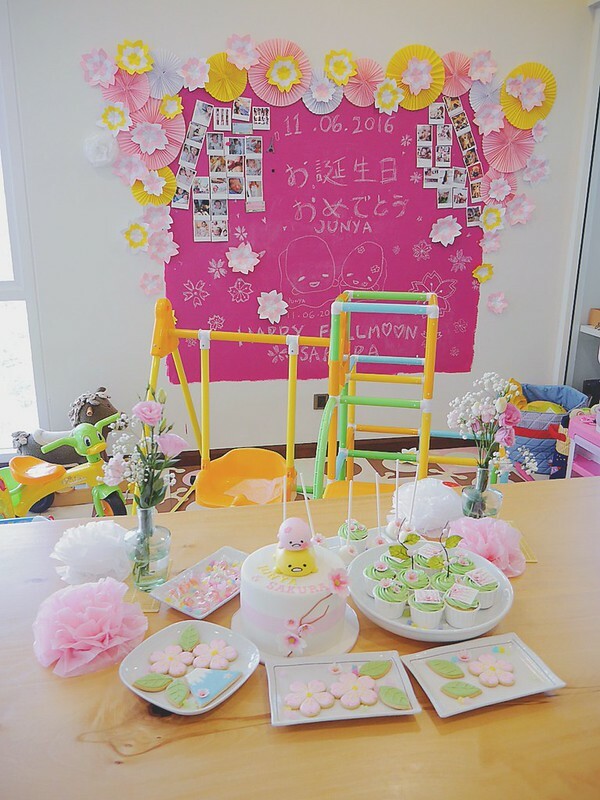 They also did the danna and Junya’s surfer themed party deco last year! 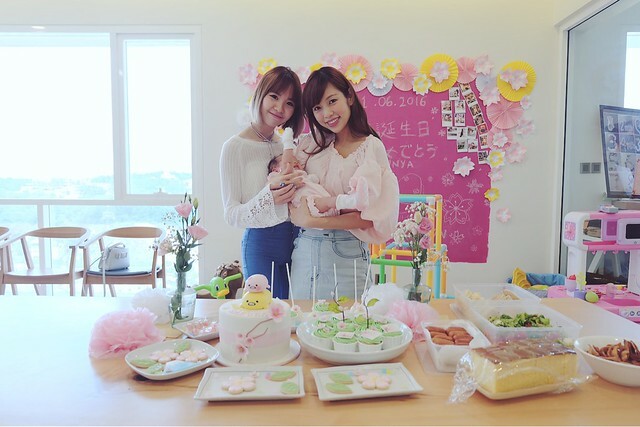 Baby Sakura turns 1 month old! 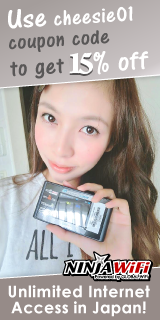 Different picture from different cameras haha. With Chanwon who came to celebrate with the petits before she flies off to Japan! Xie xie, you xin le. 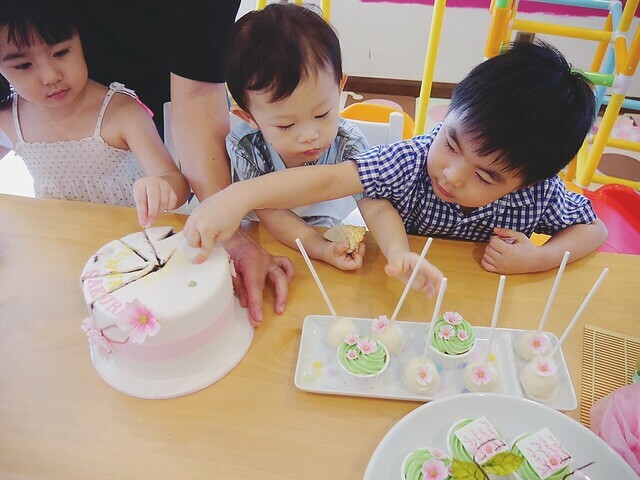 Junya couldn’t wait to touch the cake!!! Family picture!! Haha only now i realize i was wearing the same colors as both my son and daughter! The desserts were veeery popular! Now my house looks like a kindie haha. 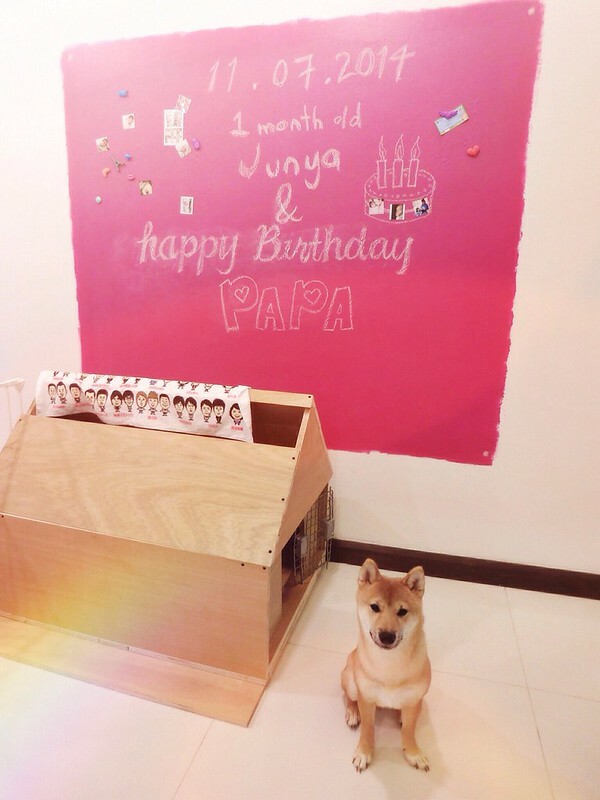 Yuna teaching Junya how to sell eggs… i guess. While the kids are at the playground, the rest are at the Adult Bar lol. Champagne, snacks and Royce choco. I was super sad because the danna chose to open a bottle of super premium dessert wine gifted to us in 2012 as a wedding present from a Japanese friend. Heard it, you guys? Wedding present. Which means it was 4 years ago. We had no chance to open it because I was either pregnant or breastfeeding -_-. With Eve, the best neighbor in the world!!! Thank you for saving my life over and over again!! 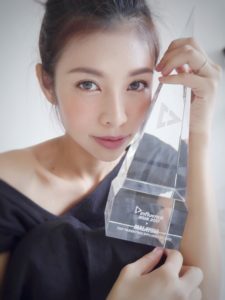 Yumi of You & Co. , who also did a great job with my last minute request. 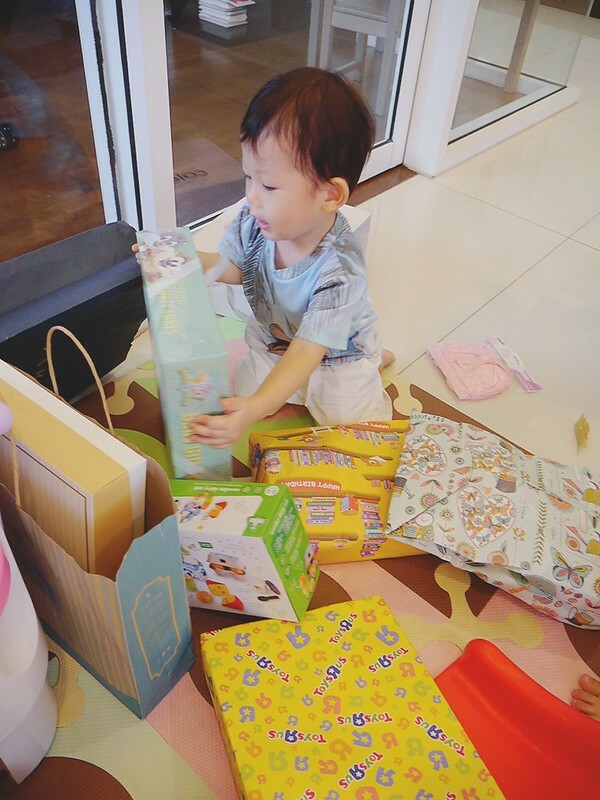 My big baby <3 May you have a happy happy Terrific Two!! Be happy, be kind and have a pure heart always. Just like your name. My little baby <3. Your life has just started. It will become greater and greater. May you always be happy and blessed, at the same time bring lots of happiness and joy to people around you, just like your name. 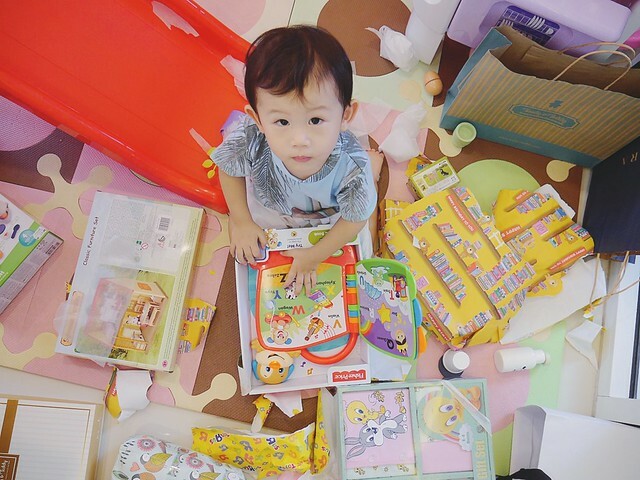 May I know the brand of the play gym? coz it really looks great.